1981 - 1983: Research Associate, Earth and Planetary Sciences and the McDonnell Center for the Space Sciences, Washington University, St. Louis, Missouri 63130, U.S.A.
1983 - 1986: Postdoctoral Research Physicist VI, Department of Physics, University of California, Berkeley, California 94720, U.S.A.
A new source assembly and high gain Faraday amplifier with 1E13 ohm feedback resistor have been installed to a new generation, multi-collector noble gas mass spectrometer Helix-MC, and accuracies of noble gas analyses improved significantly. Using the high mass resolution capability of the improved Helix-MC mass spectrometer, we re-evaluated the relative 21Ne abundance in the atmosphere. We calculate a new atmospheric 21Ne/20Ne ratio of 0.002905 ± 0.000003, significantly lower than the current IUPAC recommended value. For young samples, the revised value could increase cosmogenic 21Ne surface exposure ages significantly. 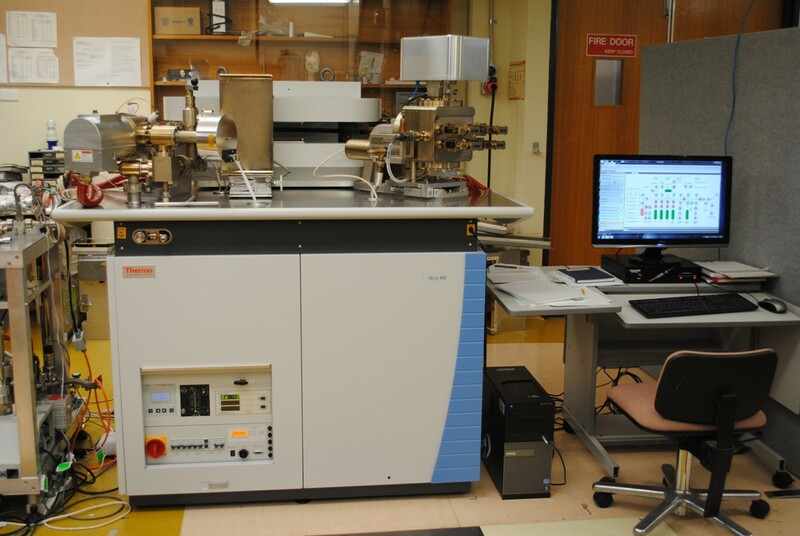 With the Helix-MC mass spectrometer operated in multi-collector mode, we are now able to produce high precision 38Ar/36Ar and Kr isotope ratios better than one per mil, necessary for searching non-atmospheric Ar and Kr in mantle-derived materials. The Quaternary Payenia Basaltic Province in southern Mendoza covers an area of approximately 40000 km2 and is characterised by intraplate, Ocean Island Basalts-like (OIB-like) geochemical signatures. In the current contribution nine new radiometric ages are presented, six correspond to the late Pleistocene and three to the Holocene from a combination of surface exposure dating and 40Ar/39Ar dating methods. The surface exposure ages obtained using cosmogenic 3He and 21Ne are in good agreement with previous publication and confidently suggest that part of this basaltic province was active at least 4000 years ago. We investigate the cosmogenic neon component in depth-profiled olivine samples from an Eocene basalt flow. Samples were collected from an 11 m thick basalt profile in the Eastern Highlands of southeastern Australia. An eruption age of 54.14 ± 0.38 Ma (2s) was determined from 40Ar/39Ar step-heating experiments (n=6) on three whole-rock samples. This age was used to calculate in situ produced radiogenic and nucleogenic 4He, 3He and 21Ne concentrations in olivine. Olivine separates (n=4) extracted from the upper two metres of the studied profile reveal cosmogenic 21Ne concentrations that attenuate exponentially with depth. However, olivine extracted from below 2 m does not contain discernible 21Ne aside from magmatic and nucleogenic components, with the exception of one sample that apparently contained equal proportions of nucleogenic and muogenic neon. Modelling results suggest ≤0.2% of spallogenic cosmogenic 21Ne production at surface. This supports a key assumption implicit in the literature that accumulation of muogenic 21Ne in olivine is negligible compared to spallogenic 21Ne. Current research has focused on two major disciplines: (1) evolution and structure of Earth’s mantle and (2) tracing Earth’s surface processes. The first of these disciplines utilizes noble gases as geochemical tracers, with significant implications for understanding the dynamics and geochemical evolution of the Earth’s mantle through time, the formation of the atmosphere, the storage of volatiles in the Earth, and the origin of diamonds. The second discipline uses cosmogenic isotopes to determine soil formation and erosion rates with implications for landscape evolution, soil management and climate change. The noble gas laboratory at RSES, ANU was designed with the aim of analysing the five noble gases (helium, neon, argon, krypton and xenon), and is one of only a handful of laboratories in the world and currently only one available within Australia with this capability. The diverse and often unique range of noble gas expertise offered by us has led to high profile collaborations with world class researchers both nationally and internationally. New noble gas analytical facilities with a new generation multi-collector noble gas mass spectrometer Helix-MC, funded by ARC are fully functioning. The HELIX-MC Plus noble gas mass spectrometer installed at the Australian National University is equipped with high mass resolution collectors, including a fixed axial (Ax), adjustable high mass (H2) and adjustable low mass (L2) detectors. 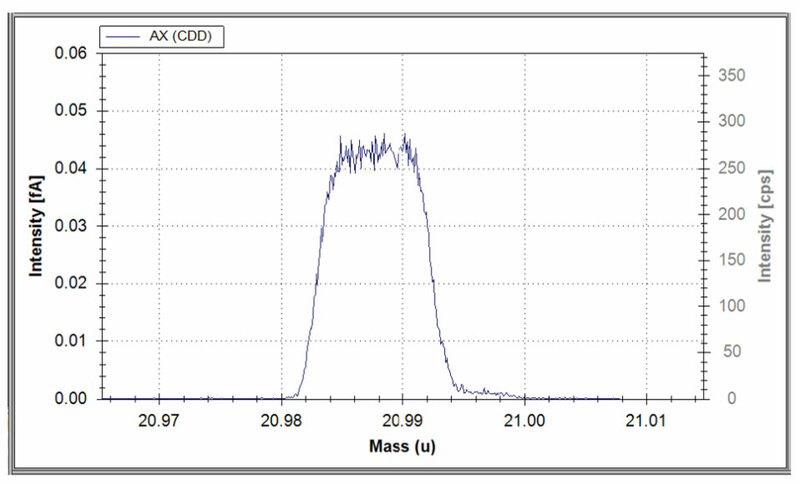 The high mass resolution of the L2 and Ax collectors permits complete separation of 20Ne (measured on L2 detector) from doubly charged interfering 40Ar (required MR of 1,777), 1H19F (MR = 1450), 1H218O (MR = 894) and partial separation of the 21Ne peak (on Ax detector) from interfering 20Ne1H (MR = 3,271). Because of the high MRP of ~8,000, 21Ne can be measured, without interference from 20Ne1H, by setting the magnet position at an interference-free position. This capability has provided the opportunity to re-evaluate the 21Ne isotopic composition of the atmosphere. Our analyses demonstrate that 20Ne1H contributes ~3% to atmospheric 21Ne measurements, with the corresponding production ratio of 20Ne1H to 20Ne being ~1E-4. We calculate a new atmospheric 21Ne/20Ne ratio of 0.002858 ± 0.000012 relative to an atmospheric 22Ne/20Ne ratio of 0.102; this new value is distinctly lower than the current IUPAC recommended 21Ne/20Ne value of 0.00298 ± 0.00011. There are several significant implications ensuing from the newly determined atmospheric 21Ne abundance. For example, in the area of Earth sciences the most critical issue relates to cosmogenic 21Ne surface exposure dating, which involves the calculation of 21Ne concentrations from excess 21Ne, relative to the atmospheric 21Ne/20Ne ratio. For young samples, where cosmogenic 21Ne contents are small and the 21Ne/20Ne ratio is close to the atmospheric value, the revised atmospheric composition could increase cosmogenic 21Ne ages significantly. Figure: Scan for atmospheric 21Ne: 20NeH interference is partially separated from 21Ne with the Helix-MC Plus mass spectrometer. We undertook noble gas and LA-ICP-MS analyses, and calculated U/Th-He ages for two fibrous cubic diamonds from the DRC. The ages are several hundred million years older than that of their kimberlite host, indicating a xenocrystal relationship with their host kimberlite. This pilot study demonstrates that the U/Th-He method appears to be a promising new approach to date the formation of diamonds. Kendrick, M.A., Arculus, R., Burnard, P., and Honda, M. Quantifying mantle- and seawater-derived volatile components in pristine magmatic glass, submitted to Earth and Planetary Science Letters. Espanon, V.R., Honda, M., and Chivas, A.R. Cosmogenic noble gas dating of young basaltic lavas from southern Mendoza, Argentina, submitted to Quaternary Geochronology. Kendrick, M.A., Honda, M., Pettke, T., Scambelluri, M., Phillips, D., and Giuliani, A. (2013) Subduction zone fluxes of halogens and noble gases in seafloor and forearc serpentinites, Earth and Planetary Science Letters, 365, 63-74. Honda, M., Phillips, D., Kendrick, M.A., Gagan, M.K., and Taylor, W.R. (2012) Noble gas and carbon isotope ratios in Argyle diamonds, Western Australia: Evidence for a deeply subducted volatile component. Australian Journal of Earth Sciences, 59, 1135-1142. Kendrick, M.A., Kamensky, V. S., Phillips, D., and Honda, M. (2012) Halogen systematics (Cl, Br, I) in mid-ocean ridge basalts: A Macquarie Island case study, Geochimica et Cosmochimica Acta, 81, 82-93. Honda, M., Phillips, D., Harris, J. W., and Matsumoto, T. (2011) He, Ne and Ar in peridotitic and eclogitic paragenesis diamonds from the Jwaneng kimberlite, Botswana – implications for mantle evolution and diamond formation ages, Earth and Planetary Science Letters, 301, 24-33. Kendrick, M.A., Honda, M., Oliver, N.H.S., and Phillips, D. (2011) The noble gas systematics of late-orogenic H2O–CO2 fluids, Mt Isa, Australia, Geochimica et Cosmochimica Acta, 75, 1428-1450. Kendrick, M. A., Scambelluri, M., Honda, M., and Phillips, D. (2011) High abundances of noble gas and chlorine delivered to the mantle by serpentine subduction, Nature Geosciences, 4, 807-812. Kendrick, M.A., Honda, M., Walshe, J., and Petersen, K. (2011) Noble gas & halogen on gold deposits in St Ives WA, Precambrian Research, 189, 313-327. Gillen D., Honda M., Chivas A.R., Yatsevich I., Patterson D.B., and Carr P.F. (2010). Cosmogenic 21Ne exposure dating of young basaltic lava flows from the Newer Volcanic Province, western Victoria, Australia. Quaternary Geochronology 5, 1–9. Wang K.-L., O’Reilly S.Y., Honda M., Matsumoto T., Griffin W.L., Pearson N.J., and Zhang M. (2010). Co-rich sulfides in mantle peridotites from Penghu Islands, Taiwan: Footprints of Proterozoic mantle plumes under the Cathaysia Block. Journal of Asian Earth Sciences 37, 229–245.